Comments: I also had a Manhatttan here in April 2016 (MPE#13) but the recipe had changed, though the price was the same. Still very good. 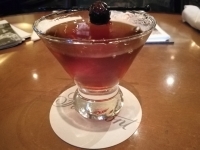 Recipe: As per menu "High West Double Rye, Sweet Vermouth and a dash of bitters"
Comments: It was fine and a reasonable price. Good but not memorable. Recipe: Came in a can called "Club Manhattan" which described it as a premium blended whiskey and sweet vermouth. I don't need to introduce Martine Nouet to anyone who reads this obscure and occasional blog. But I am going to. Martine is a well respected French whisky writer with a penchant for whisky and food pariings and to best of my knowledge she makes her home on Islay (unless some Beexiteers have chased her off by now). However after reading the attached article (link below) I might worry about the pitchforks and burning torches of the "Cask Strength Brigade" who may upon march upon her cottage chanting their mantra "you can put water in but you can't take it out" and demanding she be burnt in a wicker whisky bottle (a whisker bottle perhaps?) for her herecy. Why I hear you ask? What crime against high ABV whisky did she commit? Well she actually wrote the words "Why I dislike cask strength whisky" on the scotchwhisky.com blog earlier this year. And of course she is 100% proof right. I wish I could write (indeed spell) as well her but I did express almost all the same feelings in my blog in March 2013 .... and I have pasted relevent extract below. "Occasionally I have 'humbly' suggested that bottling whiskies at 60%+ ABV doesn’t help the product and I end up having to dilute anyway. Someone will often try and argue that is a good thing because I can “dilute to my personal taste”. I can hear them now chanting the mantra of the ABV obsessed “you can put water in but you can’t take it out, you can put water in but you can’t take it out”. But it is a silly argument. This is whisky, usually expensive whisky, not orange squash. I don’t want to buy concentrate of whisky that I can easily screw up. I want to buy the product presented to me by the people who created it at the ABV they feel best showcases their product. Many chefs don’t have salt on their restaurant tables because they want the diner to enjoy the food as they think it is best seasoned. They want the food to be judged that way and I feel whisky should be the same. 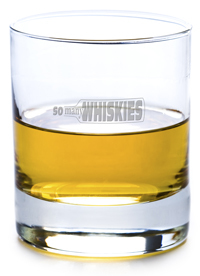 I am not saying a few drops of water to open up a dram aren’t necessary, they often are, but presenting me with 60% ABV spirit (often at cost of $100 or more a bottle) and then expecting me to guess the right water content to add to their whisky is a little asinine. I dont care what the ABV of a whisky is.... I just want it to taste good. if it does, then I am happy." Comments: Did not stand out for such an expensive version. Maybe not the best choice of bourbon for a Manhattan (no rye content). Comments: Not sure what the "orange" listed in the recipe was but it was a solid cocktail and the price was right! Comments: Not bad. Well balanced with the biiters coming through to balance out the sweetness. Comments: Unable to find a Manhattan on my Jo'burg hotel cocktail menu I improvised one for myself at airport lounge. Comments: A little washed out, the CC did not stand up well against the ice and vermouth. Good price though. Comments: Maybe the worst hotel lobby bar Manhattan I have tried. If I have to say something nice; at least it was cheap! This is not actually a terrible idea. Maple flavor is not a bad choice and I think quite compatible with whisky. However this expression is little heavy handed, even clumsy. The nose has... well maple. It smells like the inside of Mrs Butterworth's laundry basket. The taste is terribly mapley as well but with effort some spirit and even wood notes can be detected in the finish. To be honest this is more like whisky flavored maple syrup than maple flavored whisky and probably more suited to an alcoholic's pancakes than someones whisky glass.